Dame Margaret Natalie Smith, DBE , better known as Maggie Smith, is an English film, stage, and television actress who made her stage debut in 1952 and is still performing after 59 years. She has won numerous awards for acting, both for the stage and for film, including five BAFTA Awards , two Academy Awards, two Golden Globes, two Emmy Awards, a Laurence Olivier Award, two SAG Awards, and a Tony Award. Her critically acclaimed films include Othello , The Prime of Miss Jean Brodie , California Suite , Clash of the Titans , A Room with a View , and Gosford Park . She has also appeared in a number of widely-popular films, including Hook , Sister Act , and as Professor Minerva McGonagall in the Harry Potter film series. She currently stars in the critically acclaimed drama, Downton Abbey as Violet Crawley, the Dowager-Countess of Grantham, for which she has won an Emmy. Smith has had an extensive career both on screen and in live theatre, and is known as one of Britain's pre-eminent actresses. She began her career at the Oxford Playhouse with Frank Shelley and made her first film in 1956. She became a fixture at the Royal National Theatre in the 1960s, most notably for playing Desdemona in Othello opposite Laurence Olivier and winning her first Oscar nomination for her performance in the 1965 film version. In 1969, she won the Academy Award for Best Actress for her performance as an unorthodox Scottish schoolteacher in The Prime of Miss Jean Brodie, a role originally created on stage by Vanessa Redgrave in 1966 in London. 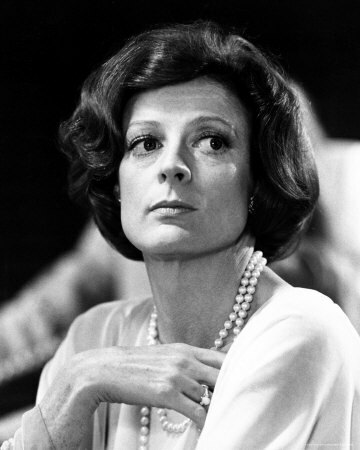 Smith was also awarded the 1978 Academy Award for Best Supporting Actress for her role as the brittle actress Diana Barry in California Suite, acting opposite Michael Caine. Afterwards, on hearing that Michael Palin was about to embark on a film with Smith, Caine is supposed to have humorously telephoned Palin, warning him that she would steal the film. She also starred with Palin in the black comedy A Private Function in 1984. Smith appeared in Sister Act in 1992 and had a major role in the 1999 film Tea with Mussolini, where she appeared as the formidable Lady Hester. Indeed, many of her more mature roles have centred on what Smith refers to as her "gallery of grotesques", playing waspish, sarcastic or plain rude characters. Recent examples of this would include the judgmental sister in Ladies in Lavender and the cantankerous snob Constance, Countess of Trentham in Gosford Park, for which she received another Oscar nomination. Other notable roles include the querulous Charlotte Bartlett in the Merchant-Ivory production of A Room with a View, a vivid supporting turn as the aged Duchess of York in Ian McKellen's film of Richard III, and a little known but powerful performance as Lila Fisher in the 1973 film Love and Pain and the Whole Damn Thing with Timothy Bottoms. Due to the international success of the Harry Potter movies, she is now widely known for playing the role of Professor Minerva McGonagall, opposite Daniel Radcliffe, with whom she'd previously worked in the 1999 BBC television adaptation of David Copperfield, playing Betsie Trottwood. She also plays an older Wendy in the Peter Pan movie, Hook and Mrs. Medlock in The Secret Garden. In 2010, she appeared as Violet, Dowager Countess of Grantham, in the first series of the British period drama Downton Abbey. She appeared in numerous productions at the Stratford Shakespeare Festival in Stratford, Ontario, to acclaim from 1976 through to 1980. These roles included Queen Elizabeth in Richard III, Virginia Woolf in Virginia, and countless lead roles with long-time Stratford icon Brian Bedford including the Noël Coward comedy Private Lives. On stage, her many roles have included the title character in the stage production of Alan Bennett's The Lady in the Van and starring as Amanda in a revival of Private Lives. She won a Tony Award in 1990 for Best Actress in a Play for Peter Shaffer's Lettice and Lovage, in which she starred as an eccentric tour guide in an English stately home. In 2007, she appeared in Edward Albee's The Lady from Dubuque at Theatre Royal Haymarket. She appeared in a 1954 BBC television programme, Oxford Accents, produced by the late Ned Sherrin. She was one of the performers, playing several roles, in New Faces of 1956 at the Ethel Barrymore Theatre from 14 June to 22 December 1956. She was "in Orange" in the musical comedy Share My Lettuce, based on the book by Bamber Gascoigne, that opened at the Lyric Hammersmith on 21 August 1957. With Anthony Bowles as musical director, it transferred to the Comedy Theatre on 25 September 1957 and to the Garrick Theatre on 27 January 1958. Smith's musical numbers in this performance included: Love's Cocktail , On Train He'll Come , Party Games , Bubble Man and Menu . 8 photos from this performance as well as an article on Smith appeared in the November 1957 issue of Theatre World magazine. One of Smith's earliest acting citations was as nominee for Most Promising Newcomer to Film of the British Academy of Film and Television Arts for Nowhere To Go in 1958. In Hollywood, Smith was a nominee for the Golden Globe Awards New Star of the Year in 1964 for her performance in The V.I.P.s. Almost 50 years later in 2012, she earned another Golden Globe Awards nomination for Best Performance by an Actress in a Supporting Role in a Series, Mini-Series or Motion Picture Made for Television for series 3 of Downton Abbey. Smith won her second Emmy Award for this role. She was awarded Commander of the Order of the British Empire in 1970, and was raised to Dame Commander in 1990. Smith has been married twice. She married actor Robert Stephens on 29 June 1967 at Greenwich Register Office. The couple had two sons: actors Chris Larkin and Toby Stephens , and divorced on 6 May 1974. Smith is a grandmother via both her sons. She married playwright Beverley Cross on 23 August 1975 at the Guildford Register Office; he died on 20 March 1998. In 2007, the Sunday Telegraph's Mandrake diary disclosed that she had been diagnosed with breast cancer. She was subsequently reported to have made a full recovery. Whole or part of the information contained in this card come from the Wikipedia article "Maggie Smith", licensed under CC-BY-SA full list of contributors here.